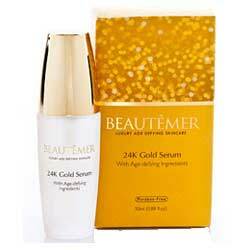 What is Beautemer 24k Gold Serum? “All that glitters is not gold” — a popular quote from William Shakespeare. Indeed, many times we are deceived by shimmering things. In recent years, gold has been widely used for skincare, having clinical procedures particularly being named after it, and a considerable number of anti-aging products clinging into one of the latest bandwagon. In fact, gold has been used for its alleged natural medicinal, and yes including anti-aging, properties in ancient civilization, although the truthfulness of claims remain to be largely unsupported to this day. There are reports, however, that gold is used as an anti-inflammatory agent for the treatment of certain neuro and muscular ailments. This could spell the link between gold and anti-aging skincare, afterall! 24K Gold Serum boldly makes claims about infusing gold in its formulation, with gold being the primary active ingredient. 24K Gold Serum is available via the product website, affiliate websites, and resale sites including eBay. The cheapest price you can get hold of this product is $69.95. Other than making the common wrinkle cream promise of lifting and rejuvenating your skin, this product’s makers clearly fall short of explaining exactly how this product is bound to do so. Beautemer 24k Gold Serum– Does It Really Work? What are the Ingredients Beautemer 24k Gold Serum? What are the Ingredients in Beautemer 24k Gold Serum? Active marine collagen: It helps to replenish our skin and helps to reverse aging also improved skin hydration and firmness. Pure honey: Honey is naturally antibacterial, so it’s great for acne treatment and prevention of aging.It is extremely moisturizing and soothing, so it helps create a glow. Dead Sea minerals: It helps to enhance your skins ability to retain moisture, making it healthy and silky smooth. Vitamins: It help fend off the signs of aging because of its vital role in the body’s natural collagen synthesis. It helps to heal damaged skin and, in some cases, reduces the appearance of wrinkles. However it may cause redness or warm feeling on skin. How To Apply Beautemer 24k Gold Serum? Wash face with clean water and a gentle cleanser. Tone skin if deemed necessary. Apply 24K Gold Serum liberally on your face, neck and decollete. Repeat this routine twice daily to improve and speed up results. It helps to reverse aging also improved skin hydration and firmness. It helps to heal damaged skin and reduces the appearance of wrinkles. but may cause redness or warm feeling on skin. This product is very expensive and yet, very little information about the product’s formulation, studies made if any, and even manufacturer profile are openly shared. It’s hard to say anything about this product, and even more challenging to give it a fair evaluation given the limited information available. While this product claims to be made from real gold, there remains to be very little scientific evidence that links gold to improving the appearance of aging skin. The makers behind 24K Gold Serum obviously falls short of backing up product claims. If these issues do not raise your red flags then you must really buy this product’s claims. If you’re wary, however, it may be best to skip this and move on. This product does not offer money back guarantee. Karin Herzog Review 2018: Ingredients, Side Effects, Detailed Review And More. Derm Exclusive Review 2018: Ingredients, Side Effects, Before & After, Detailed Review And More.